Monitoring system activity is one of the most critical aspects of system operations. Real-time monitoring of your infrastructure is vital – as an operator or system administrator, you want to be notified about any events regarding system health so that appropriate measures can be taken to fix issues in a proactive fashion. Solace message brokers generate a wide variety of events and metrics for monitoring by using open interfaces such as Syslog and SEMP, and these need to be integrated with your existing enterprise monitoring tool for alerting purposes. Note: My previous post shows you how to integrate Solace with your enterprise monitoring system using Syslog. Based on my experience in the field, such monitoring integrations generally are slow to implement, are not prioritized as much as setting up functionality, and an operations team may not be exposed to the variety of information available for monitoring system activity. Solace HybridEdge is a standalone Java Spring application built around Apache Camel that allows you to integrate Solace message brokers with other messaging systems, such as RabbitMQ, ActiveMQ, IBM MQ and Kafka, in a standards-based fashion. Apache Camel is a mediation framework built to solve the problem of enterprise application integration. Apache Camel is a powerful open source framework, based on the well-known Enterprise Integration Patterns, that enables the integration of different enterprise systems. It is a modular framework consisting of a number of components – each acting in an abstraction layer for integrating with a particular enterprise system. The primary use cases for HybridEdge are to integrate Solace messaging running in public clouds, private clouds, or enterprise data centres with other legacy messaging systems. Among these, HybridEdge can also be used to solve other common customer problems. 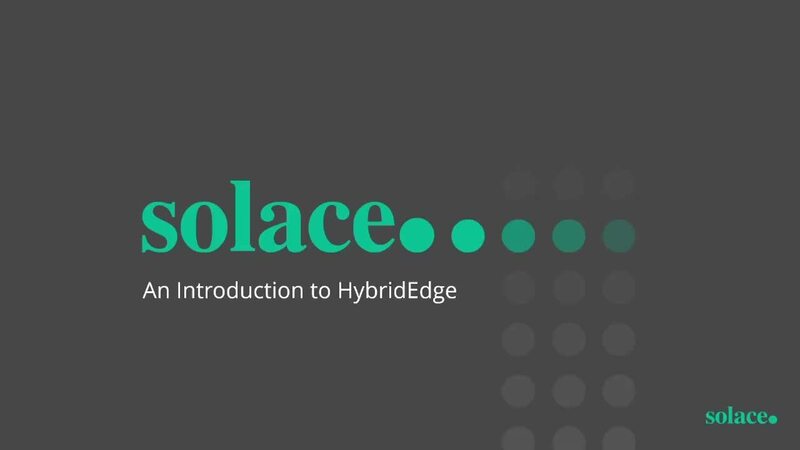 In this post, I’ll show you how to quickly set up HybridEdge to monitor your Solace PubSub+ broker so that from Day 1 you have basic monitoring and alerting of your Solace PubSub+ instance. You do not need a developer environment or build tools such as Gradle or Maven. emergency or critical conditions, such as a routing blade taken offline due to excessive temperature. In addition, Solace message brokers can be configured to generate and publish these events over the message bus to well-known topics. Monitoring applications can subscribe to these topics and be asynchronously notified when a new event is generated. Let’s configure HybridEdge to subscribe to these monitoring events generated over the message bus and post them to Slack for alerting. For this tutorial, we are going to listen on System level events only, although these can also be extended to message-vpn level events. the Slack component will post these messages to a Slack channel to generate an alert. Optionally, you can add a processor in step 2. to customize the content of your alert message, but for this demonstration, I will keep things simple and post the event message as-is. For simplicity, in this example I am going to use HybridEdge to subscribe to “#LOG/>” to receive all the System events at all Severity levels. Note: This integration will not work with messaging services created on Solace PubSub+ Cloud, as you cannot connect to or configure the management message-vpn on PubSub+ Cloud. In order to enable HybridEdge to post messages to Slack, you need to configure an Incoming WebHook URL. For more information, refer to the Slack documentation. When defining the WebHook, you can define the Slack channel to POST message to when using the WebHook. This command should post a test message to the #general channel. You can modify the channel parameter as required. These libraries can be downloaded from the Maven repository. Once the third party libraries have been downloaded and placed in the “jars” directory, copy the application.properties file from the ‘samples’ directory and place it in the HybridEdge home directory. Modify the file to enter the details of the Solace PubSub+ broker that you want to monitor and your Slack WebHook URL. Set the property “spring.main.sources” to slack.xml, which we will create in the next step. In addition, set the Solace JMS property “solace.jms.directTransport” to true, as we want HybridEdge to receive the event messages using the direct transport. Over the course of this blog post, you have set up HybridEdge to monitor system events on a Solace message broker, redirected the events to a Slack channel, and established basic monitoring of your Solace PubSub+ instance. This was achieved using the HybridEdge runtime and modifying the Camel/Spring configuration. If you want to get your hands dirty, download the HybridEdge Starter project from GitHub to write your own custom message processor and define more complex routes. As next steps, you can optionally add a Camel processor class if you want to format the message displayed on Slack. In a future blog post, I will show you how you can set up Email notification of Solace system events. Please feel free to leave me any comments regarding this example, or comments for the entire community. If you have any issues sending and receiving a message, check the Solace community Q&A for answers to common issues.